Is the CX4 an expensive point and shoot, or does it offer something extra? The Ricoh CX4 was released only a few months after its predecessor, the CX3. With many serious competitors in the high-end compact market, have Ricoh updated the camera enough to warrant shelling out more money for the latest version? The CX4 certainly has plenty in common with the CX4 (albeit with slightly more rounded edges for better grip) including the same 10.7x optical zoom (4.9-52.5mm - 28-300mm equivalent), 3 inch 920,000 dot transparent LCD and a 1/2.3 inch, 0 megapixel CMOS sensor. The CX4 is not equipped with a viewfinder, so you'll need to use the rear LCD to compose your shots. You can still pick up the CX3 at a cheaper price, so what are you paying extra for in the newer model? Image stabilisation has been improved, along with redesigned AF tracking and "night landscape multi shot mode" for low noise, low light images and a range of new creative filters including soft focus and toy camera effects. 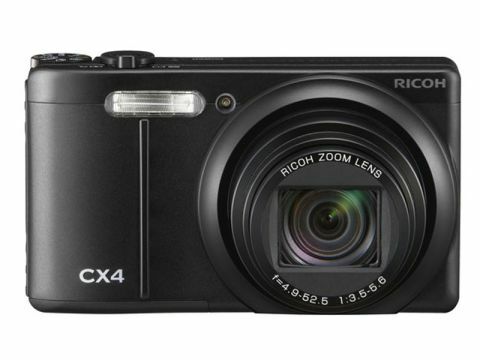 At first glance, the Ricoh CX4 looks like it should belong in the same class as premium compacts like the Panasonic Lumix LX5 and the Canon Powershot S95. Indeed it has the same sleek black styling found on these cameras, and appears to be a high quality product. It's also reassuringly weighty and sits well in the hand, the finger naturally resting on the shutter button ready for action. The body feels robust, if a little plasticky, but those new curved edges lend it in air of class. DSLR photographers will welcome the scroll wheel at the top of the camera, along with the joystick on the rear, giving the appearance of seriousness for what is essentially a point and shoot model. The mode dial itself is a little awkward to use when shooting one-handed, but this is something you could get used to over time. The joystick, which unfortunately feels a little flimsy, also proved annoying when used with the menu. Head to a menu option and find the setting you want to change, press down on the joystick to activate this change? Wrong, frustratingly this takes you out of the menu – you need to remember to press right if you want to activate something. Again, this is a nuance that you get used to with time. It could also be said that using the tiny joystick may prove awkward to bigger hands that might prefer dedicated arrow buttons instead. Unlike premium compacts such as the S95 et al, shooting in manual exposure mode is not an option with the CX4. The closest thing you'll get to this is by using the "MY settings mode" on the top dial, where you can preset a number of different options such as ISO, aperture, image size and white balance. This might prove handy if you want to always make sure you shot in a low ISO, or at a particular white balance and don't want to rely on the auto settings. You can't adjust aperture or shutter speed though, as you would be able to on the (admittedly more expensive) premium compacts on the market. Another frustrating feature of the CX4's My Settings mode is its inability to remember the settings you were just using, in any mode. So, for instance, if you change the ISO to 100, switch off the camera and pick it up again, it will have reverted to whichever preset you have saved. If you want it to remember what you have been using before you switch it off, you will need to dive into the Setup menu and select Reg. My Settings – hardly a quick operation. A large zoom range (10x) is one of the most impressive and saleable features of the CX4, and a great bonus for travel photographers. Those who like to have the greatest level of control may find it frustrating that you can only zoom in steps (i.e. 28mm, 35mm, 50mm and so on), but at least zooming is a fairly quick operation. The zoom ring around the shutter release is a little plasticky and doesn't feel particularly well built. The noise emitted from the camera as the lens is fully extended sounds rather worrying, until you hear the noise it makes while attempting to focus, not the most discreet of sounds. The rear 3 inch 920,000 dot LCD screen is one of the best features of the CX4. It's bright, can be seen well in bright sunlight and is sharp. A handy electronic spirit level appears when shooting with the camera in both vertical and horizontal orientations, helping you to capture straight horizons, but it's worth noting that it won't work when pointing the camera straight down towards the ground. As with many compact cameras, a key concern is start-up time. Shooting in Auto mode, it takes around 3 seconds to boot up and another second or two to focus and take, most of the time. Although shutter lag is thankfully virtually non-existent, in certain situations, it struggles to find a focus point and will hunt around for a few seconds before locking on. This isn't a super quick camera, but it will do for most situations.